A range of ready meals from one of Germany’s best-known brands, namely Erasco, is being packed in a custom-moulded multi-layer bowl from RPC Bebo Plastik.The new format offers enhanced consumer convenience and microwaveability, two benefits of increasing importance in the context of today’s busy lifestyles. In particular, the product can be consumed straight from the container. The 113mm diameter tubs with a filling weight of 380g are thermoformed in PP/EVOH/PP with the EVOH acting as an effective oxygen barrier to provide an ambient shelf life of 12 months. In addition, the stability of the bowl means it is fully retortable. For maximum shelf impact, the tubs are decorated with attractive thermo shrink sleeves that are cool to the touch after removal from the microwave. The complementary caps are manufactured using RPC Bebo’s advance Bebo Print facility, where the film is printed prior to thermoforming to create an all-over decorative effect across both the lid and its rim. The lid decoration includes graphical instructions for the microwaving of the container. 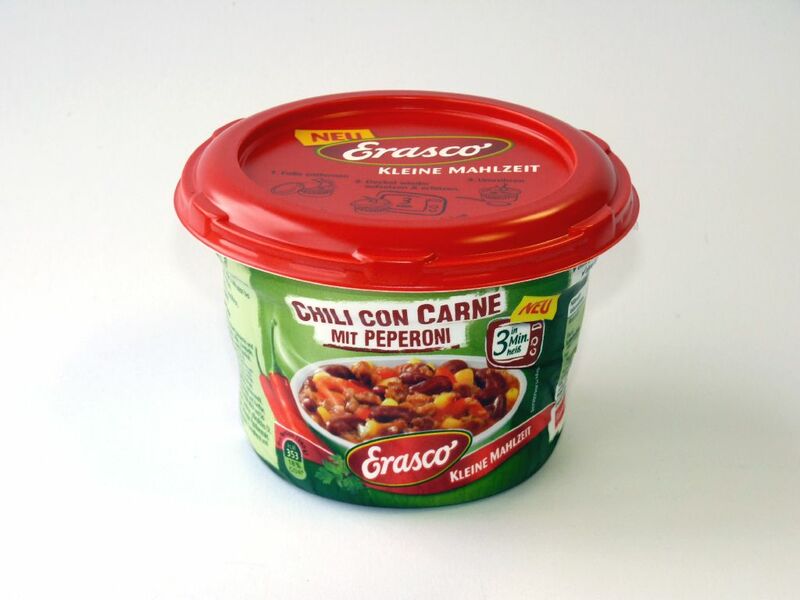 Overall, the pack conveys the right quality image in line with the reputation of the Erasco brand.“We are delighted with the new packaging which meets our requirements both in terms of modernity and manufacturability while offering maximum convenience to the consumer,” comments Kurt Ziegler, Director R&D for brand owner Campbells Germany.